List of the latest Russian TV series in 2019 on tv and the best Russian TV series of 2018 & the 2010's. Top Russian TV series to watch on Netflix, Hulu, Amazon Prime & other Streaming services, out on DVD/Blu-ray or on tv right now. 2018, 2017 & the 2010's best rated Russian TV series out on DVD, Bluray or streaming on VOD (Netflix, Amazon Prime & Hulu). People claim it's the best Russian tv series since Brigada. It's not often we come across a successful comedy series from Russia - so that's why it deserves a place on the list. The series is about a Russian mayor who gets sentenced to house arrest after taking bribes and being generally corrupt. Very little is known about this Russian project with appears to be some kind of post-apocalyptic sci-fi show, but the photo's and art work are stunning. We can't wait to find out more. A comedy series about the kitchen in the restaurant 'Claude Monet' in Moscow. A documentary series about the Bulgarian mystic Baba Vanga. A comedy series about vour interns working in a hospital. A security director is fired and gets a job as a high school sports teacher. He is willing to do everything to get his old job back. An action-packed Russian sci-fi show about a world that came after us, in which there are no more laws, and you have only yourself to count on for survival. 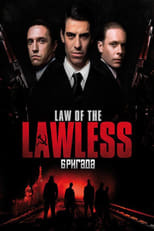 Law of the Lawless, aka Brigada, is a hugely popular Russian gangster show from 2002 about a group of four friends and the lawless enterprises. The show has very graphic scenes depicting violence, and has therefore received some mixed reviews. Many still consider it to be one of the best Russian shows of all time though. Russia has an impressive art house industry, but not as much is known of their national television. Here is what we know about Russian tv series. Cinephiles know that Russia is a force to be reckoned with: Russian directors since long have been responsable for astonishing contributions to the world of cinema. In the world of television, there are some gems to be discoverd too. Below, our pick of the best Russian TV series.